We had a lie in this morning and when we got up decided to have one of our snacks we'd bought using our snack credits for breakfast. This was delicious! Should have cost $5.49. After breakfast  we headed to the premium outlets at the top of i drive for abit of shopping and then onto the mall of millennia. 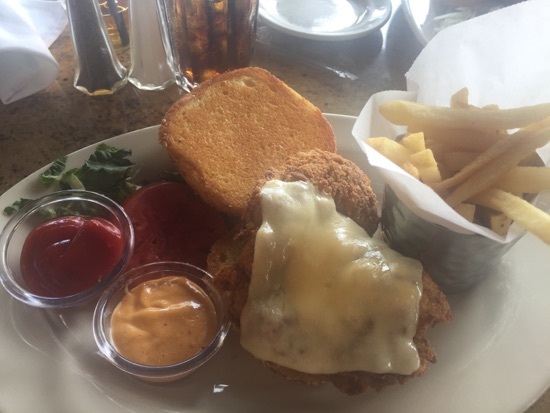 We decided to try Cheesecake Factory for lunch as I've heard loads of good things but never been there. I got the spicy chicken burger with chipotle mayo. This was lovely! The chicken was huge and I had to cut some off to fit it in the burger so I could eat it. 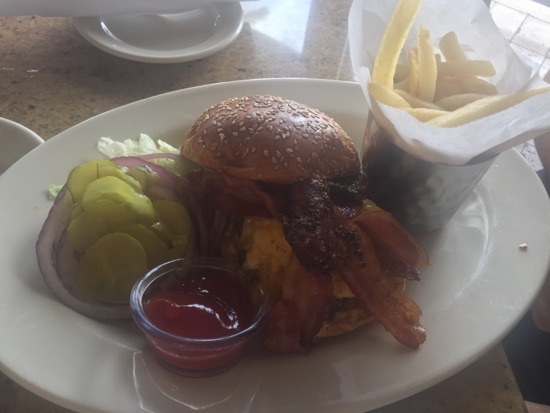 DH had the bacon-bacon burger. This was a bacon cheese burger and he really enjoyed this! Unfortunately DDs meal came out and it was wrong, we ordered her spaghetti and meatballs but they brought us butter pasta. By the time they brought her meal DH and I had finished ours and DD had made do with bits of ours. Not ideal. She did eat abit of the spaghetti but I didn't manage to get a picture as she'd waited long enough! Our server wasn't great to be honest, not only did she get our order wrong, she took away our glasses of Coke to refill and didn't bring them back until well after we had finished our meal, at least 10 minutes later. The meal came to $44, can't fault the food but our server was pretty useless. 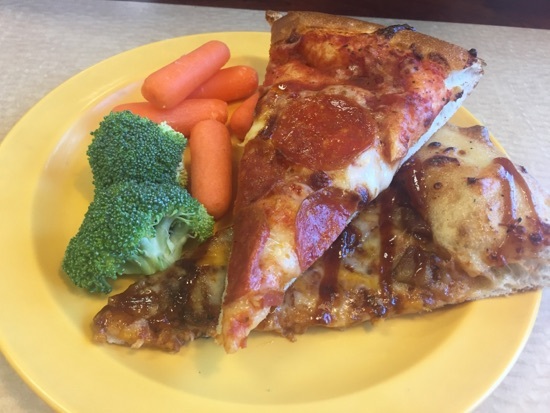 For dinner this evening we went to Cici's pizza at lake buena vista. 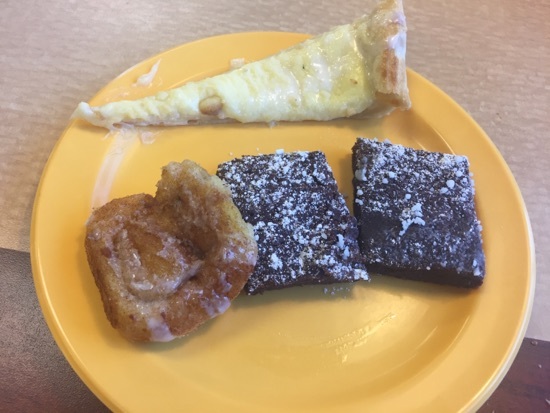 We had a coupon from the Clarion for a free adult buffet. It cost us $15 for 2 adults and 1 child thanks to the coupon and DD eating for free as she was under 4. 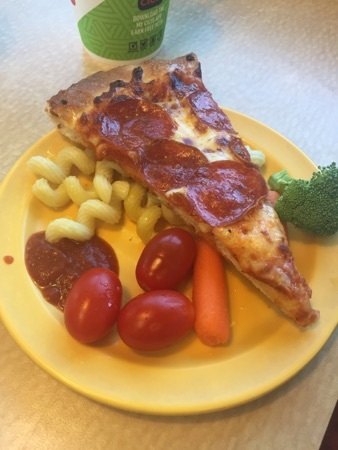 DD has some broccoli, carrots, tomatoes, pasta and pepperoni pizza and really enjoyed this. I had pepperoni pizza, pepperoni stuffed crust, cheese and meat flatbread and some garlic flatbread. These were all nice. Had some ranch dressing to go with it from the salad bar. DH had pepperoni pizza, BBQ chicken pizza, carrots and broccoli. Dessert here is surprisingly good. The dessert pizza was weird, it was a kind of egg custard on pizza but tasted like antiseptic. Didn't take more than a bite. The chocolate brownie was sooooo good! Really soft and gooey. The cinnamon roll was the big surprise, this was really good and I went back for seconds. When we got back to the room we shared another one of our mickey head rice crispy treats that we bought with our snack credits from the dining plan. Tomorrow we're up really early for the Star Wars 5K run. New Photo Added by missdopey - 21 Apr 17 3:46 AM. Can't wait to try cheesecake factory. Shame about the service at The Cheesecake Factory, but the food does look pretty good. 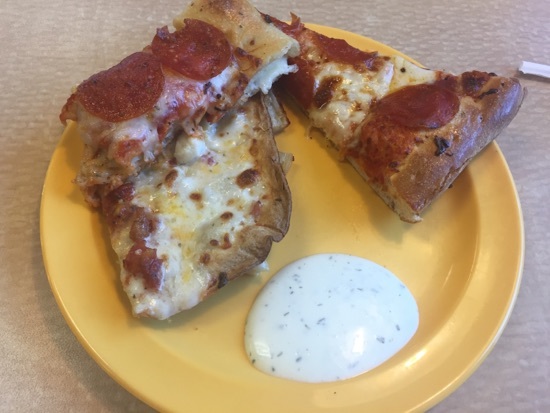 Cici's Pizza doesn't look too bad either. I've just binged read your reports, thanks for taking the time and effort to do them (I did a live report last year so I know what goes into it). 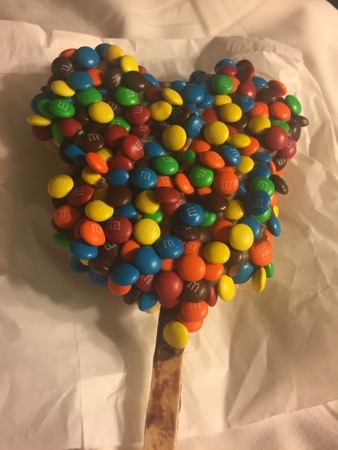 Oh god I could eat mickey rice Krispy heads with m&ms everyday!